Stand-up special from Carlos Mencia. 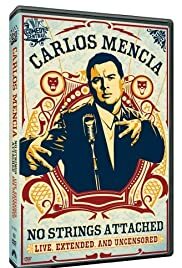 A compilation of Carlos Mencia's best material from the show Funny Is Funny. Carlos Mencia is speaking his mind and taking no prisoners. Enter the Mind of Mencia and get ready for a merciless mix of up close stand-up, unconventional street interviews, and shocking commercial parodies. Carlos Mencia was excellent this is hour special. He was working hard to show everybody he was the real deal. I know people have said he's stolen material in this special, but that is not true. Carlos brings comedy up front the way he wants it, not how anyone else wants it, that is why he is so good. People say he's not funny because he says Dee dee dee too much, and they still haven't realized thats part of his act, and they don't want it that way, but he brings it like that anyway, and succeeds in making people laugh. For all the haters out there, here is a message, Carlos is here to stay, you have no point in trying to bring him down.